Is a garage rented by the council a good option for storage? We have to move out before August as the landlord has decided to sell the property and gave us notice we have to vacate the property at the end of the tenancy in August. Among other things, we're finding it hard to find a place big enough for my partner's record collection (I don't want to get into too much detail about the renting requirements we have) and DJ equipment so he has had this idea of maybe putting the stuff into storage so we can simply find another 1 bed place (so space would be less of an issue) instead of looking for a 2 bed place. We have seen the council here rents garages in various areas. They look big enough to accommodate his stuff and cheaper than proper storage facilities per week. I wonder if anyone else has used council-rented garages before where they live and if they're safe (as in they're not easy targets for burglars). It would probably be better to rent one in the parts of the town that are known for being quieter and safer but still would like opinions or the suggestions. Thanks in advance. A garage can be broken into in seconds very easily, even with riveting on additional bolts etc you may as well leave the locks open. The lock in the handle can be ousted with a flat screwdriver and a hammer in one hit. Thieves now have battery angle grinders to just cut the padlock lock off, had our council garage broken into, a bike which I had bought dirt cheap was taken along with some tools, kept the next bike and tools in the house instead and got rid of it, wasn’t covered by insurance as it wasn’t part of the house. After a house fire helped my mum find a self storage unit which had half a house of contents put in it and it wasn’t that expensive £40 per month. 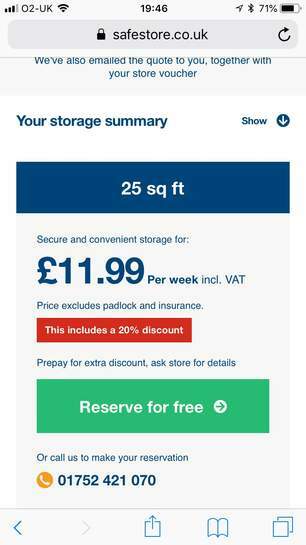 So given the fact you want to store records/DJ equipment you should use self storage, they are relatively cheap and they are secure!! You pay for the space you use so if you want something roomy you can move around in and put your records on freestanding shelves (you would need to buy them or use the ones you have at home) you’ll pay more than one where you have stacked everything up high. You buy your own lock for the space so they don’t even have access to your stuff and the places are normally kitted out with CCTV and insured. Some of the bigger ones have 24 hour access and some have less access at weekends and no late night access. Compare prices and be prepared to move around every so often to maximise the savings. 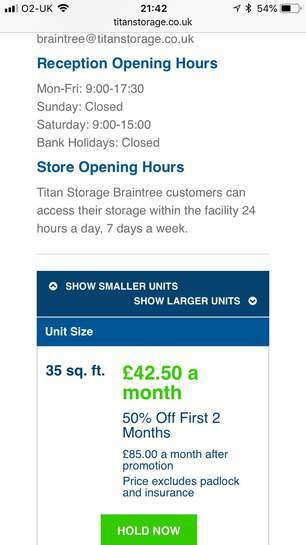 Just to add, many small businesses (internet based ones) in cities like London are now working out of self storage units as the space is cheaper than renting a building. Most of the council garage rental agreements I have seen (all two of them!) specifically exclude use for storing anything other than a vehicle, which kinda implies an element of deception may be required plus insurance may be difficult. Most of the council garage rental agreements I have seen (all two of …Most of the council garage rental agreements I have seen (all two of them!) specifically exclude use for storing anything other than a vehicle, which kinda implies an element of deception may be required plus insurance may be difficult. Agreed I think it would be impossible to even obtain an insurance quote for an insecure lock up, best to stick to purpose built premises for anything of value. Also, it may not be water tight or weatherproof. Nothing worse than going back only to find all the contents covered in moud and mildew. There are other security measures you can buy toadd to a garage door to stop it being opened, but I would have thought that any extra padlocks etc would ignite any thieves imagination as to what was inside. How about trying to rent a 1 bed flat that also has access to loft space. Yep, agree with this, they wont rent out for anything other than Private Vehicle Parking, if they fing out its being used for storage they will take back off you. Around here, you need to prove you have a Vehicle and its registered in your name, the Garage you apply for needs to be within reasonable walking distance to where you live, otherwise they will refuse a rental to you. how much space does he need? does he need a whole garage? the word council equates to insecure so i wouldn't want to store DJ equipment in a council garage. if he doesn't need a whole garage, it may be a good idea to drop a leaflet at neighbouring properties with a big garage to ask if they would consider renting out some space to you for an annual or monthly fee. depending on where you are in the country, some properties have a huge amount of storage space in the garage that the house owner does not need. Thanks for the replies. The council here says explicitly on their website it's ok to use them for storing other things too so that wouldn't be an issue. I thought about the mould issue too... Well I was certainly put off reading your comments. He has at the moment 4 racks full of records up in the house. Our living room is just full of plastic boxes with records inside and his equipment. I don't have space for anything else. I can't even sit on the sofa lol. The records are worth a lot of money all together. 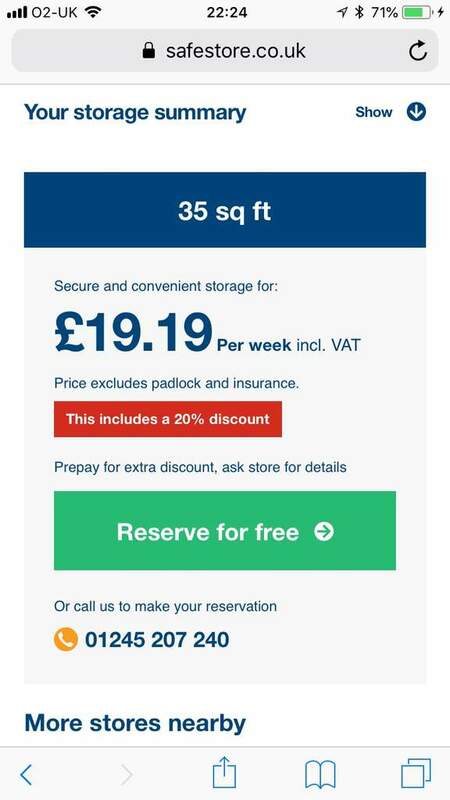 I think 25sq feet should be enough but the quotes I got were about £115 for a month for that space. Seems a bit too much. Will have a look at cheaper storage probably. Also, it may not be water tight or weatherproof. Nothing worse than going …Also, it may not be water tight or weatherproof. Nothing worse than going back only to find all the contents covered in moud and mildew. There are other security measures you can buy toadd to a garage door to stop it being opened, but I would have thought that any extra padlocks etc would ignite any thieves imagination as to what was inside.How about trying to rent a 1 bed flat that also has access to loft space. We have a loft in our current 1 bedroom house but no space for anything more than my suitcases. Certainly couldn't put the amount of records and equipment he has in a loft. They weigh a ton as well. Thanks for the replies. The council here says explicitly on their website …Thanks for the replies. The council here says explicitly on their website it's ok to use them for storing other things too so that wouldn't be an issue. I thought about the mould issue too... Well I was certainly put off reading your comments.He has at the moment 4 racks full of records up in the house. Our living room is just full of plastic boxes with records inside and his equipment. I don't have space for anything else. I can't even sit on the sofa lol. The records are worth a lot of money all together. I think 25sq feet should be enough but the quotes I got were about £115 for a month for that space. Seems a bit too much. Will have a look at cheaper storage probably. Also don’t forget these storage place spaces are usually quite tall so you could get some metal racking from b&q and just fit more on it than in our house. That was on safestore.co.uk but there are more. Average cost £52 per month. I meant 35 sq feet but now not sure that would be big enough. Maybe 50 sq feet. Thanks.. That's the same quote I came up with earlier today. Braintree is a bit far from here but it could be an option. Seems like storage is more expensive around here then. I couldn't find anything around £40 for that kind of storage space. Thanks.. That's the same quote I came up with earlier today.Braintree is a …Thanks.. That's the same quote I came up with earlier today.Braintree is a bit far from here but it could be an option. Seems like storage is more expensive around here then. I couldn't find anything around £40 for that kind of storage space. Works out about £82 per month on average.chelmsford. Why dont you offer to buy the house you are living in and that would solve your problem, and you would also have your foot on the property ladder.